Halton specialises in creating indoor environments that enhance wellbeing and improve building performance. We put comfort, safety and sustainability first. Our strength is tailoring end engineering our products and systems to meet challenging needs. Halton Vario is a complete demand-based ventilation system that guarantees occupant comfort at all times while optimising energy performance. Comfort conditions are automatically controlled through occupancy, temperature and CO2 monitoring in all spaces. 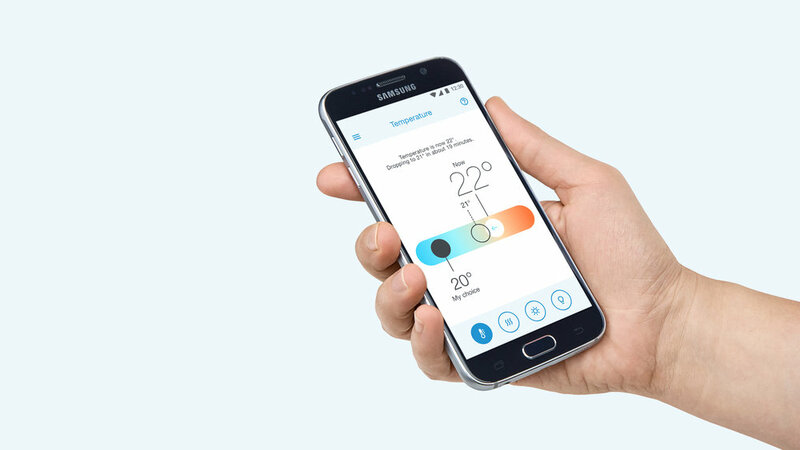 Democratic control of the indoor environment with the user-friendly Halton WellMe voting application allows individual adjustment for preferred conditions. The Halton Vario office solution consists of intelligent ventilation control system, airflow control dampers, room ventilation units, indoor air quality sensors and a user interface for democratic indoor environmental control. Room units are active and equipped with dampers and control units. Active room units enable variable airflows while maintaining throw pattern and air velocity. This results in constant comfort conditions without risk of draught. Spaces are monitored by indoor air quality sensors, which measure factors such as occupancy, temperature and carbon dioxide. Based on occupancy data, the ventilation can be switched from “unoccupied” minimum to “occupied” medium mode. Temperature and CO2 monitoring are used to boost ventilation when required, in order to achieve optimal comfort conditions and minimise energy consumption, for example in meeting rooms. The Halton WellMe user application enables voting for preferred comfort conditions. Based on all votes collected from a specific comfort zone, the system adjusts the indoor environmental conditions according to the median vote. Ventilation zones are controlled by airflow control dampers that maintain constant static pressure in the ductwork. Constant pressure enables variable airflows in spaces with different needs, e.g. a meeting room can move from unoccupied mode to boost mode without affecting the open office space in the same duct branch. Zone dampers control the central system that operates the air-handling unit. By optimising the performance of the air-handling unit on a demand-basis, energy savings of up to 50% can be achieved. These are fully adaptable for customised design solutions. The chilled beams installed in The Wellbeing Experience are tailored with integrated acoustic panels and LED-lights to contribute to the air quality, thermal comfort, acoustic environment and lighting in the space. Halton Rex Exposed (REE) is a combined cooling, heating, and fresh air unit for suspended installation. The built-in flexibility enables easy and fast adaptation of operation during space layout and usage changes. One of our newest and most innovative solutions, the ultra-slim unit Halton Siu is designed for demanding needs in terms of space height and layout flexibility. The unit operation guarantees occupant comfort and excellent air quality in all operating modes thanks to flexible airflow control and heating/cooling capacity. Halton Siu easily adapts to changing user requirements and operating conditions, reducing workspace churn costs. The unit consists of two independent unidirectional induction units, providing fresh conditioned air to the space. The ultra-thin unit is only 80 mm high. Each module is configured, and factory programmed to offer accurate thermal control and comfortable air distribution within the space. Other building services such as lights or blinds may be integrated to the unit control. Halton Siu offers the prefect solution for space refurbishments as well as new construction projects where room height is limited. Meeting rooms, phone booths and open-plan offices may be located anywhere in the building without compromising the comfort of occupants or fresh air supply. The unit design is based on two independent unidirectional induction units with supply flow on both sides. The design allows construction of partitioning walls between the induction units, dividing the unit operation over two blocks. Halton Siu is suitable for modular design, installation and control. Modifying the ventilation module in response to new partition layouts only requires remote adjustment of the building management system (BMS) without need to access the terminal units. The modular design reduces commissioning, installation and maintenance cost as well as energy consumption thanks to the demand-based control. Circadian lighting, fresh air and thermal comfort is brought together in the result of a joint innovation project between Halton and Light Cognitive. A chilled beam based on the Halton Siu model (more information above) with integrated Light Cognitive developed Big Sky circadian lighting. Displacement ventilation units for low-velocity supply airflow. The principle of displacement ventilation is supplying fresh air at a low level, next to walls, in corners, or through the floor. The cooler supply airflow from the units lifts the warmer room air and contaminants to the ceiling of the space where it is extracted through Halton Exhaust diffusers.